BOISE – A bronze statue of Abraham Lincoln that’s long been tucked away on the grounds of the Idaho State Veterans Home is believed to be the oldest Lincoln monument in the Western United States. Plans are under way to move it to a location near the state Capitol in time for the 200th anniversary of Lincoln’s birth next year. “There was an older public statue of Abraham Lincoln, it was in San Francisco, and it dated all the way back to 1866, but it was destroyed in the 1906 earthquake,” said David Leroy, chairman of the Idaho Abraham Lincoln Bicentennial Commission and a former state attorney general and lieutenant governor. The cost of moving the statue will be raised from a penny drive by schoolchildren that will begin in the fall, with rededication of the monument set for Lincoln’s birthday, Feb. 12, 2009. The 6-foot-4-inch bronze sculpture, atop a nearly 10-foot-high sandstone pedestal, bears a date of Feb. 12, 1915, and the inscription “Presented to the State of Idaho by the Ladies of the Grand Army of the Republic of Boise.” The work is one of seven created by Ohio sculptor Alphonso Pelzer titled “The Emancipator”; the others were placed in the East and Midwest. Leroy said several scholarly works documenting Lincoln monuments across the nation show Idaho’s as the oldest surviving one in the West. Spokane’s downtown statue of Lincoln dates from 1930. When Idaho’s statue was first placed at the Old Soldiers Home in 1915, it was six years after the introduction of the Lincoln penny, which is reproduced in large size on a plaque on the statue’s base. The introduction of the penny and the centennial of Lincoln’s birth prompted a “resurgence in all things Lincoln,” said Leroy. It also was a time when Civil War veterans who had moved to the Boise area were reaching retirement age. The statue stood at the Old Soldiers Home for about 55 years. When that facility moved to the current location of the Idaho State Veterans Home a few miles away in the early 1970s, the statue moved with it. Today, the sandstone pedestal is marked by makeshift patches, most of them hidden behind a low brick wall that also contains a sign for the Veterans Home. 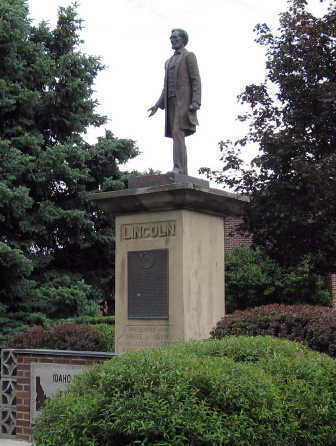 Near a bus stop and surrounded by foliage, the bronze statue shows Lincoln holding a partially unrolled scroll in his left hand, inscribed, “Proclamation of Emancipation,” while his right hand is extended slightly forward, as if he’s about to speak passionately to persuade an audience. Leroy said the move will include a complete restoration of the sandstone pedestal, overseen by Boise landscape and sandstone expert Gerhard Borbonus. The Idaho Horticultural Society, which recently redesigned Capitol Park across from the state Capitol, will design walkways and landscaping to complement the statue in its new location on an island in the center of Capitol Boulevard, a half-block south of a statue of Idaho Gov. Frank Steunenberg. Lincoln will face south, toward the Boise Depot, along a prized view corridor that runs from the hillside train depot through downtown to the Capitol. Leroy expects the penny drive to raise more than enough for the move and related educational efforts, although he didn’t have a firm cost estimate. A new plaque also will be added to point out Lincoln’s ties to Idaho, from establishing the Idaho territory “with the stroke of a pen” in 1863, to helping pick the name “Idaho,” to appointing the first territorial governor. Brasuell said the current site of the statue may have to be altered in the future anyway, in part because parking is so tight on the grounds of the veterans home.